So... one of the many desktop regressions introduced in the Fedora 14 desktop is affecting the basic image viewer, eog, which became almost unusable: the colors are wrong (see the photo above) and the image loading times are unbearable slow. 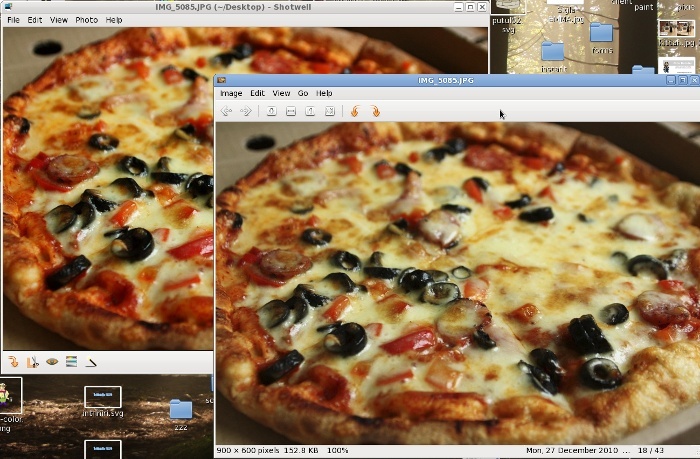 So I decided to try Shotwell, the new default image viewer in Fedora, which I use only as an image viewer, not as a photo manager, it has correct color reproduction, is fast but lacks many essential features and has horrendous user interface. With this said, I am looking forward, with very moderate optimism, to the situation in Fedora 15, where so far everything in nebulous and the upcoming GNOME 3 may make me a temporary refugee in the Xfce camp. In the middle of the preparations for a sad Christmas a courier rang at the door: "I have a package for Mr. Buculei"... me, in my mind: "WTF? I didn't ordered anything... Oh, it must be the book!" A few weeks ago a couple of my friends who are writing a FOSS book together (don't ask, they will talk about it when they will feel ready for that) asked me for a review of their proposal, I did it and the publisher offered as compensation a book of my choosing from the InformIT offer. 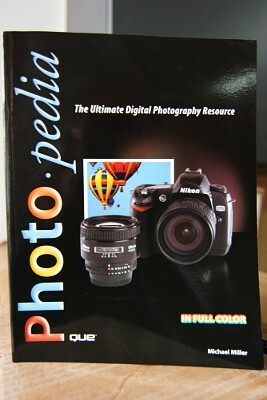 As many of their books, about Microsoft and Adobe products, are uninteresting, my choice was for the single photography book not mentioning Photoshop. The book is beginner-oriented but at the time I had a friend making the first steps into photography who I am sure would have loved it, so the plan was to give it to her. Now I will start by reading it myself, any book must have something useful to learn. So... thank you my friends, thank you publisher. Yesterday Fedora Design Team weekly IRC meeting had on its agenda a sketching session about what will become the default wallpaper in Fedora 15, it was supposed to be a new experiment for the team. Then the bomb dropped: Mo forwarded a "special request" (from the sound of it looks non-negotiable) from the Red Hat Desktop Team: in Fedora 15 the wallpaper in the default spin, the Desktop Live CD, which is under discretionary control of the RHDT, to be the default upstream GNOME 3 wallpaper. The reason: F15 is supposed to be the first distro featuring GNOME 3 and wanting to increase visibility of that feature, it looks to me as a desperate move to pimp GNOME 3 (in the light of Ubuntu ignoring it and going for the competing Unity) and a much awaited dismissal of our team. Also, an insult to the other Fedora spin and a break of the consistency of the user experience. Some people inside Fedora think GNOME branding is more important than the Fedora branding, and they have control of our default image. To be fair, the proposed wallpaper is made by jimmac, for who's work I have great admiration, and look professionally done, even if a bit bland: a set of vertical blue stripes. The reactions inside the team ranged (see the log) from outright opposition, to doubts and to surrender to the greater powers. Some brainstorming happened towards a graphic concept that may be an alternative on the default spin and the default on the the [second-class] others. In the end "we" avoided to draw a conclusion, letting it in suspension, for people to get used to the idea, which later may be showed easily down their throats. Happy holidays. And bend over. Yesterday we had the last LUG meet for this year, and the last in this current location (from next month we need another place, still looking for it). One above another, it was a good one. I presented, as planned, a lightning talk about creating presentations with Sozi, an Inkscape extension. Then, as the schedule seemed light enough, I continued with some Inkscape demo drawing. Then Petre shared his experience with signatures and cryptography on Linux, Doru continued with a talk about databases and Matei closed with a presentation about a Fully Automated Install (FAI) on Debian. I should mention there are photos from the event, many of them brought with the contribution of an unexpected helper, thanks a lot!